I've been exercising a lot more recently and I'm really starting to feel the difference! 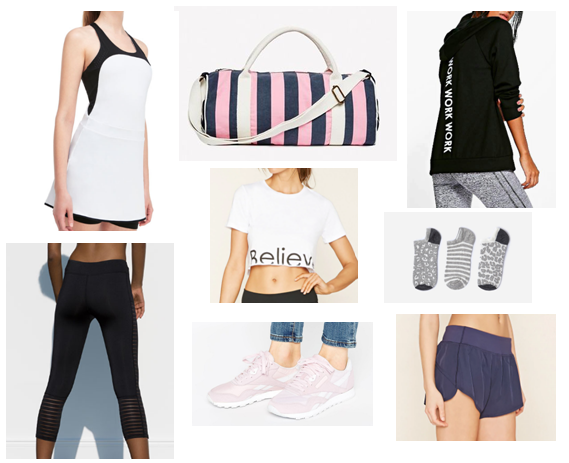 Not only is it great news health-wise but it's also a great excuse to buy lovely new workout clothes! awesome choices! love the gym bag!! Thanks - it's my fave as well! The Gym bag is gorgeous! It's so cute isn't it?! I love those leggings - I could spend so much money on workout clothes! Nice work out wishlist! Great selection of items! wow so lovely collection for workout. I love to buy Kurtis online for workout and outdoor. Thank for sharing. Ooh I haven't heard of them - I'll have to have a look thanks!